Most of us have played video games shooting at asteroids, or watched a starship maneuvering through the Asteroid Belt on television. But have you ever seen a real asteroid in the sky? This week is an excellent opportunity to see one of the largest asteroids, Pallas, as it reaches opposition to the Sun. The first asteroids were discovered in the early years of the 19th century. The first four asteroids, including Pallas, were discovered in a 6 year period from 1801 to 1807; a fifth asteroid was not discovered until 38 years later in 1845. This ushered in a rich period of asteroid discovery, with three dozen more discoveries in the next decade. Once photography came into play, thousands more asteroids were found. The Asteroid Belt in reality is quite different from what you see in science fiction programs. Rather than being crowded with space rocks, the Asteroid Belt is mostly empty space. Most of the time, if you were standing on one asteroid, you would need binoculars or a telescope to spot the nearest asteroid. The chances of two asteroids colliding is virtually zero. Although Pallas and Vesta are nearly identical in size, they are quite different in their composition and appearance. Pallas is a typical rocky asteroid, quite dark in surface colour, resembling a carbonaceous chondrite meteorite. Vesta, on the other hand, is highly reflective, the only asteroid sometimes visible with the naked eye. For the rest, binoculars are needed to spot them. Asteroids, as their name implies, look exactly like faint stars. What gives them away is their rather rapid movement against the background stars. 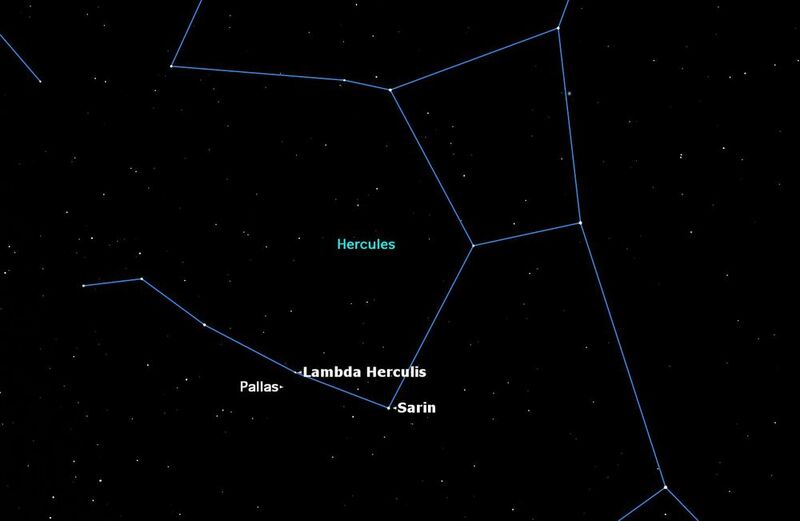 This week Pallas reach opposition in the eastern part of Hercules, very close to the 4th magnitude star Lambda Herculis. It is motoring along from east to west at about one degree per week, so that in three weeks time it will be close to the 3rd magnitude star Sarin (Delta Herculis). Its movement from night to night, as seen in binoculars, is quite obvious. The large asteroid Pallas will be in opposition to the Sun in Hercules on Thursday, June 11. Credit: Starry Night software. The path of Pallas over the next 14 days carries it parallel to the stars Lambda Hercules and Sarin. The labeled dot is Pallas’ position on June 11, and the dots to the right mark its daily travel westward. Credit: Starry Night software. I particularly like watching asteroids when they are passing close to a bright star. In a telescope, you can see their movement over even a 15-minute period. At opposition, Pallas will reach magnitude 9.4, making it easily visible in binoculars. It will be 2.405 astronomical units from Earth, or 224 million miles (360 million km). A tiny object, sure enough, but interesting to see with your own eyes.